Listening to Rush during my drive today (I like Rush, but I was really waiting for Dana Loesch to come on afterward), I heard him say something peculiar. Rush is usually right, but not today. He was addressing a caller who was wondering why one of Romney’s campaign managers could be so inept as to bring up Romneycare in response to the crazy Joe Soptic advertisement. That response, of course, was about as incompetent as it was possible for it to be. This led Rush to diagnose the difference between the Democrats and Republicans. Rush hypothesized that the Democrats were made up of tons of small special interest groups that clashed with each other usually, but all agreed that they had to beat us. He further went on to say that we did not come together as Republicans in the same way. There is something to that, but it’s still wrong. None of us wants to see Barack Obama re-elected, for sure. We’d gladly put aside any differences between us to defeat him. 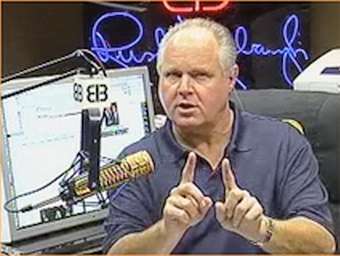 No, Rush… The problem with the establishment Republicans is that the old guard still has the nonsensical idea in their head that they can actually be friends with the Democrats. When Harry Reid took to the Senate floor with outright lies about Mitt Romney not paying any taxes at all for ten years, I actually saw Lindsey Graham say that he liked Reid, but that Reid just wasn’t being truthful. And Rush… That is the problem, right there. Mr. Graham, I can guarantee you one thing. Harry Reid does NOT like you. Harry Reid hates the very air you breathe. And if he was ever nice to you at any point, it wasn’t genuine. He’ll only pretend long enough to get as close to you as he can before he sticks a knife in your back. Younger Republicans and Tea Party members understand this truth, and that is where the disconnect lies within our coalition. Mitt Romney showed some glimmer of understanding this when he refused to play along with Democrat shell games and release even more of his tax returns, but his campaign staff certainly doesn’t get it at all, and the establishment itself is clueless. They still think they can all get along and hold hands singing Kum-baya. That will NEVER happen, and it’s time they realized it. The Democrats are playing hardball 24/7/365 and if we don’t go for their throats, they WILL get to ours. Our best hope is that Romney nominates a Vice Presidential candidate that understands a truth that Romney himself has so far failed to grasp. There are no “gentleman’s rules” in modern politics.